When Bob Houghton spoke out against M.S. Gill's sports ministry for not doing anything to raise quality football infrastructure, he was only expressing the anguish of a coach who was unable to find a decent enough ground to train his national football team ahead of the coming Nehru Cup tournament. What kind of notice the ministry has taken of the national football coach's complaint one is not aware. But fearing that the government would not take kindly to it, the All India Football Federation, his employers, lost little time in distancing itself from Houghton's view, saying it was his personal opinion. Though one need not agree with everything Houghton says, still his unflattering views about how the game is run in India calls for deeper dispassionate examination. Houghton, 61, an English league club midfielder in his playing days with experience of coaching, among others, the Chinese national team as part of his curriculum vitae, was not asking for the moon when he went about searching for a single ground good enough for a national team to train. The onset of the monsoon made things more difficult. It ruled out holding the coaching camp in Goa or other centres in the south and in the east. As for grounds in Delhi, they were closed for renovation for the coming Nehru Cup followed by the next year's Commonwealth Games. Going by past experience, even the Tau Devi Lal Sports Complex ground at Gurgaon was not an ideal venue, what with javelin throwers, shot-putters and others also training there. Unsurprisingly, Sunil Chhetri, one of the rising stars of Indian football, has come out in support of Houghton. The coach, whose methods have produced some good results, is adored by his players, who welcomed the idea of renewing his contract when it came up for review some months back, notwithstanding his rubbishing of time-honored tournaments like the Santosh Trophy and the Durand Cup. A way has to be found for these tournaments to play their own part in Indian football without in any way allowing them to diminish the importance of the professional I-League, now come to stay as the highest grade of football in the country, providing players an opportunity to making a decent living. 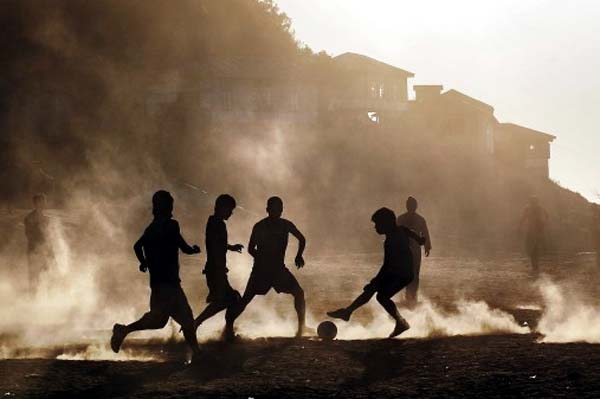 For Indian football to prosper, the game has to be thriving at all levels and at all places - in schools, small towns and villages and every neighborhood. That is what football is all about, a truly people's game, or the "aam admi's" game if you like. Even Houghton should have no quarrel with Gill's ministry for restoring its "priority" status to the "aam admi's" game, no matter if India's standing in the world order is as low as 147, although the sports minister's recent reported remark that any Australian school team is good enough to beat the present Indian team, a remark made in a different context. He said it at a function to honor the surviving members of the fourth-placed 1956 Melbourne Olympic Games team. It was a remark which should not be taken too seriously. Only a handful of teams took part in the 1956 Olympic Games in times when the world's top teams, excepting some east European countries like Hungary and Yugoslavia, did not take the Olympic football tournament that seriously because the Olympic movement was strictly for amateurs. We still like to gloat over the 4-1 victory over the novice of a 1956 Australian team but forget the 0-3 defeat to Bulgaria in the fourth placed match, or the 1-10 rout by Yugoslavia at Helsinki in 1952. History, as Henry Ford has said, is bunk. The fact is the Indian football team has made some progress under Bob Houghton but to keep pace with the developments elsewhere the progress has to be much faster and more energetic. And for this to happen creation of basic infrastructure is important. Houghton has brought some system and new ideas to Indian football, but the momentum has to be more dynamic. Look at it this way. There are clubs in the country over a hundred years old, at least two of them in Delhi alone -- Young Men and Moghals, to name them. But none of them owns a stadium or ground it can call its own. Surely, this situation cannot be allowed to go on. Everybody has to lend a helping hand, not least the government. Houghton's views may have disturbed many of us. But if they can stir us to create more football infrastructure, his outburst would not have gone in vain. Meanwhile, Houghton will be taking his men out to Dubai for a training stint there before some more practice games in Spain. Then it will be back to Delhi's pretty little Ambedkar Stadium, which will have been adequately spruced up by August. It was here that India had won the 2007 Nehru Cup tournament to breathe some new life and vigor into the game.